Public transit is a convenient and easy way to get where you’re going, whether or not a personal vehicle is available. It’s important to know your route before you leave the house. 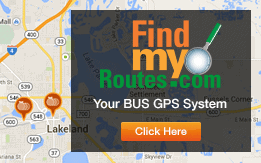 Information on all routes is available on this website, can be found on google transit or by using a System Guide, which provides all the routes and time points for both the Lakeland and Winter Haven systems. You will also find a QR code on over 1,500 bus stops throughout Polk County that when used with your smart phone (free app required), will take you directly to Find My Routes, a unique website that helps you find the closest bus stop to your location, etc. If you’re not sure of how to get where you want to go, just give us a call at 855-POLKBUS (765-5287). Looking forward to sharing a ride with you! It’s classic simplicity, flash your Valid Polk State College Photo ID and snag a bus ride for FREE to your destination.